While I could fill you all in on the reasons for my relative absence over this last temporal stretch (new job, new city, New England), I would rather pay tribute to an unavoidable truth. The last 24 months have invited a nearly global need, shall we say, for diversion and Trazodone-- I mean good cheer and community engagement. No. What I actually mean is diversion and Traz, but since I'm rooted in a rather more "hugs-not-drugs" model, we'll have to settle for substances that follow the same neurological pathways in the brain, the abuse of which can also land you in the E.R., or at least in the on the hunt for some waistband extenders... the greatest anxiolytic of all: Food. In these divided times, I think it's a good place to start. To quote a genius: "All of humanity has one thing in common: The sandwich." Not so long ago, (OK, a really long time ago), Zoog and I were ambling around DC's Mount Pleasant neighborhood, and as often happens, we were stopping at every one of those Little Free Library jobbies that are popular now. Mostly we look because Zoog feels best when he is near trash, but this particular Little Free had a couple absolute gems, one of which was a copy of Women's Day magazine from 1955. I'm a sucker for old periodicals. I love the escapism--err--history and insight they provide. And as luck would have it, this issue's cover features Adam Rippon's dad as a kid, or something, and the promise of not just a few, but one hundred and ninety-two paths to watch your cares, and your cheese, melt away: Varyingly-edible mid-century sandwiches! Fun Fact: Before 1989, Americans were only 60% water, but over 25% mayonnaise. Interested? Of course you are! Just grab a big tub of Oleo from your bomb shelter, and a loaf of your whitest bread. Then head upstairs to gaze into your wood-paneled electric icebox . Today it’s quite likely you’ll find containers of exotic ethnic condiments like salsa and hummus. Open the meat and cheese drawer, and you might see some turkey breast or an aberration like— Heaven forfend— a plant-based meat substitute (are we still at war or something?). 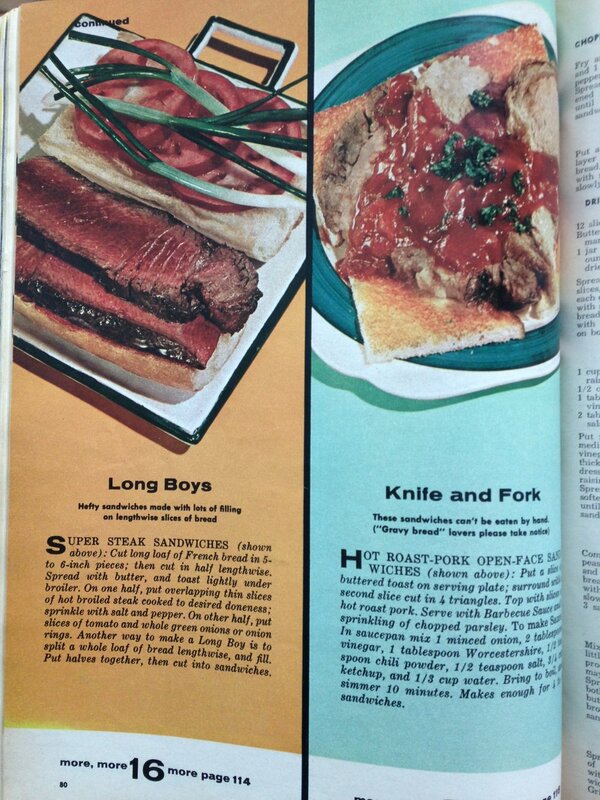 But the kitchens of yesteryear were stocked with heartier fare, as is made apparent by at least two-thirds of the sandwich “recipes” in this marvelous magazine. …but really, in a profusely McNuggetted world, isn’t this refreshing? NO? Gonna hurl? Hmmm…. Now you’ve obviously asked your butcher to carve this organ up nice and thin (please let it be thin? 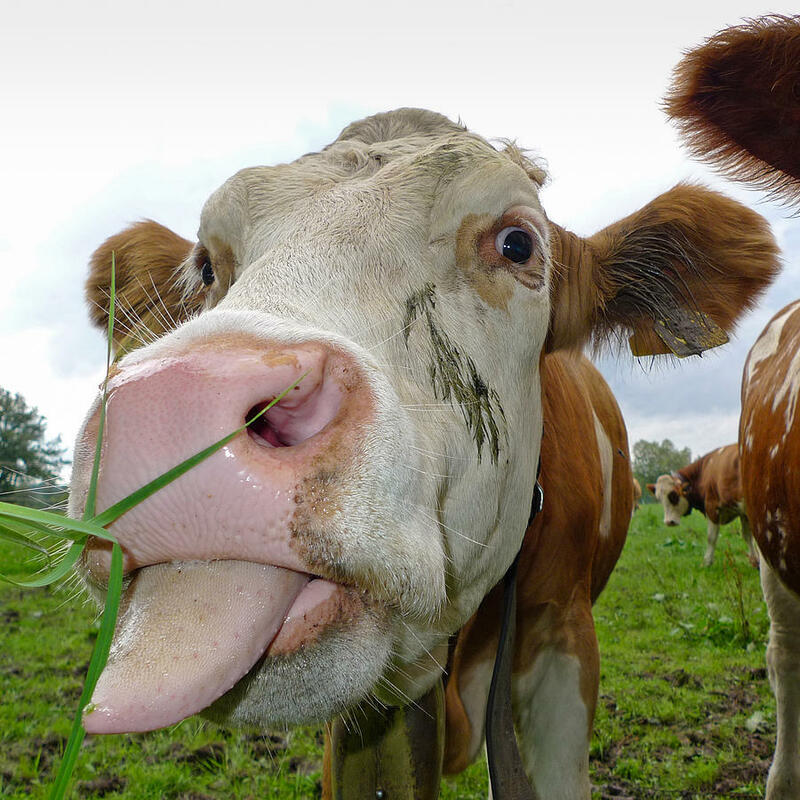 ), but you’re still stuck with four pounds of cow’s tongue. What to do? Eat up, mate! Here’s one helpful prep. Don’t have time for all that fresh tongue gathering? Use canned! The first line says it all: Mix tongue, cheese and chutney. No, YOU mix tongue, cheese and chutney! And because it’s the 50s, you’ll need margarine and milk. You know, I have to say that the act of grilling might take the foulest edge off the combination, sort of like tanning can make a person look .8% less obese. Don’t skip past the ingredients list at the top right, either: horse-radish, apricots and cream cheese. But at least it wasn’t ripped from a cow’s maw before you ate it. 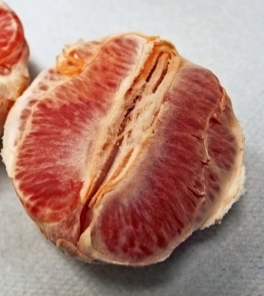 If you’ve not yet acquired this taste for taste organs, there’s a less lingual option. 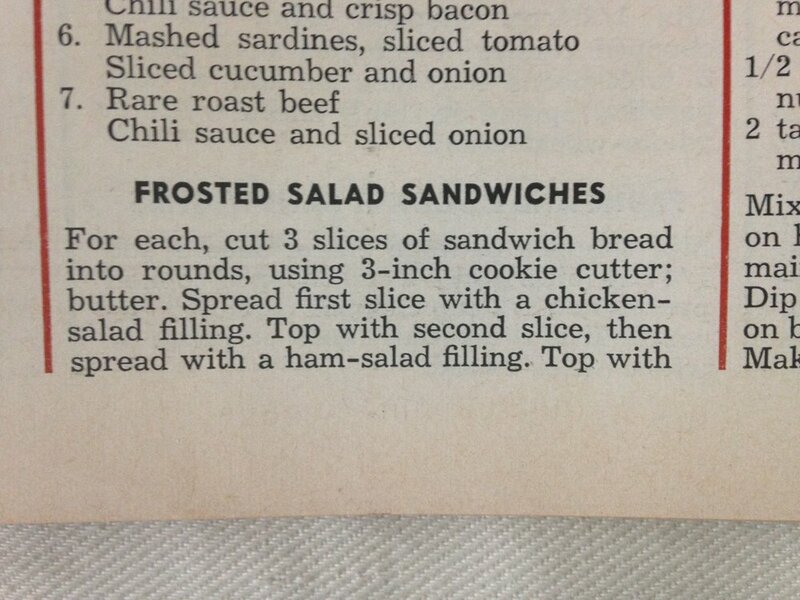 If flakes are good frosted, why not “salads?” This ain’t no Betty-Crocker-Rich-and-Creamy-meets-Caesar proposition, it’s a sensible approach involving canned ham, mayo and cream cheese frosting (thinned with milk, because what IS this, 1925?) The “recipe” continues into the next photo, but don’t miss the last half of the “stack-ups” instructions just below. (In case your curious, steps 1-5 involved consecutive layers of radish-cucumber mayo, ham and swiss coleslaw, salmon salad, crab meat salad, and peanut butter, chili sauce, and bacon. Sounds useful to Delta Pi for their hazing rituals, if nothing else.) See for yourselves! Still hungry? Fry up a quick banana-and-cheese (above) for a bedtime snack. Not sleeping so well? Maybe it’s because you ate a banana-and-cheese sandwich as a bedtime snack. Remember “stack-ups” from before? And I see a grilled cheese sandwich but if they think they can trick me into eating my “process American cheese” without tongue and raisins, they can go scratch. 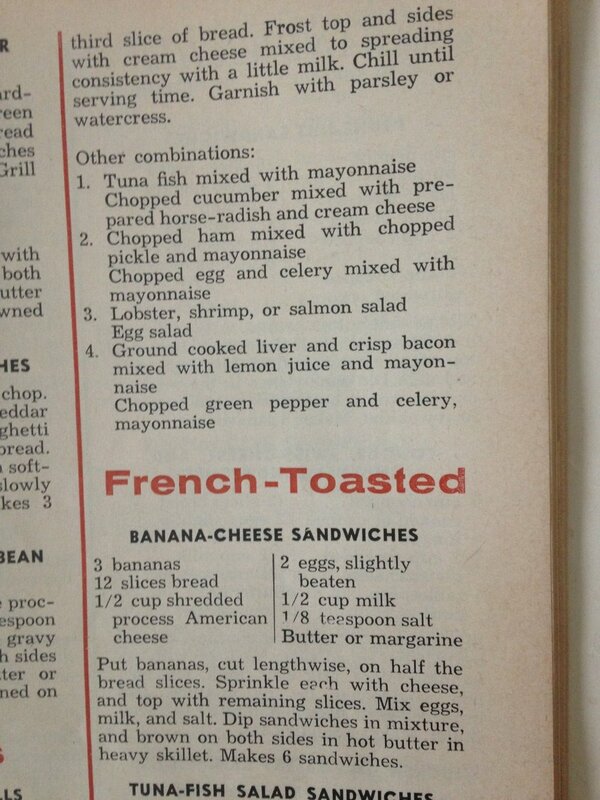 Chuckle as we might at these endless combinations of cheese, banana, tongue, raisins and ham salad, Women’s Day is a gift to the modern reader, not so much for its innovative lunch solutions, but for its irreplaceable look into post-war America and the culture of domesticity. All I’m saying is in an era of “Six Weird Things Celebrity Pythons Can’t Go Without,” and “Quick Tips to Get Your Boss Into Bed,” it’s refreshing that a periodical would really see something through to the end. Maybe even past the end. 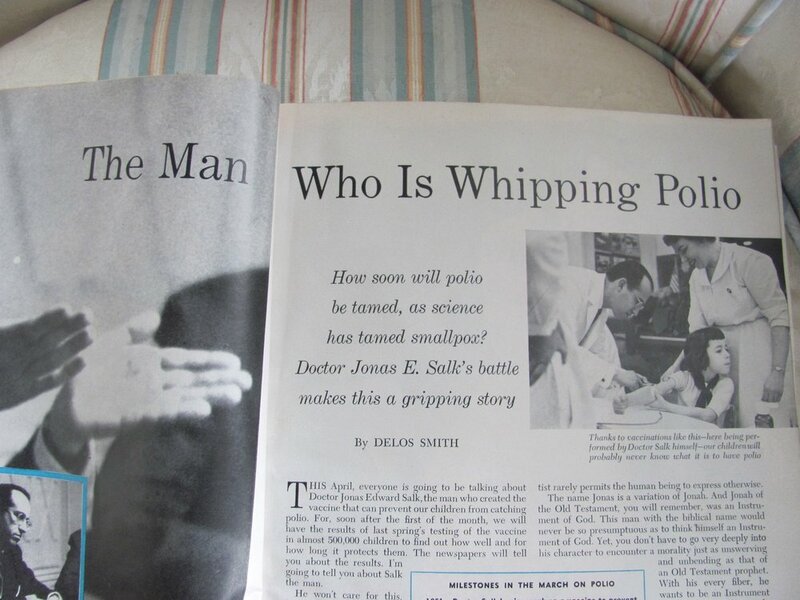 It was a time of hope— the kind of hope that begets the courage to invent Wiffle balls and cure polio and combine tinned fish and tropical fruits. So here’s to the sandwich—even to the ones we’d never dare put in our mouths—and to the mouths that fill our sandwich. I know, I know; I can hear you clamoring: How dare you disappear for nigh on two plus years, and expect us just to fall back into place as if we’re not different people now with different needs?!? Yes, and we’ll get to that, but first: A shopping list! By now you all probably know that Zoog can be rather…oblique. What fun is it, he surely reasons, to say the same thing time after weary time? Why not express every need—no matter how basic— in riddles and rhymes? How marvelous to invert and amalgamate! Why not fold, spindle and mutilate the very rules and conventions that allow us to communicate at all? Sure, we may get hoist on a petard or two of our own making, but that’s what keeps things spicy, America! Pass the salt? No way. But I will send a brackish morsel forthwith. Hold this for you while you use the bathroom? Not a chance, Doofus. But bestow the freight encumbering your evacuation strategy, and I’m your helpmeet. The only trouble—aside from the time all the extra syllables take—is that Zoog also employs this method when it comes to written communication, adding two other confound-able elements: orthography and penmanship. 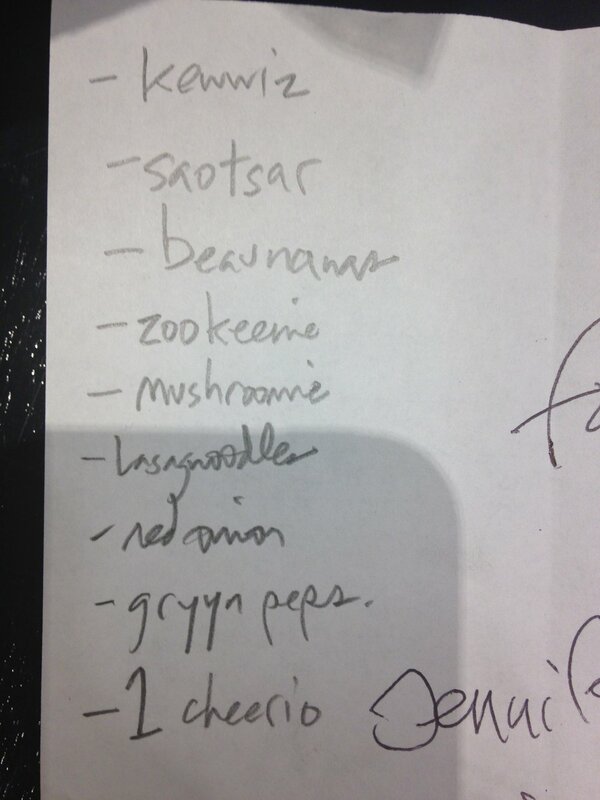 While his handwriting would make a roomful of doctors scowl, Zoog is quite capable of spelling things “correctly” (he was seventh grade spelling bee champion of J.T.Moore Junior High, but got booted from regionals on account of L-I-B-E-L), he simply chooses NOT to. Once you say it out loud a few times and channel several distinctive speakers (mostly of the under-five crowd), the items may become clear— sort of like my dad’s favorite birthday card urging the celebrant to chant an ancient native birthday mantra: OHWAH TANOL DEF ART IYAM—but some codes just can’t be cracked. And so we starve most of the time. And that is how we’re sticking to our new year’s resolution to slim down. 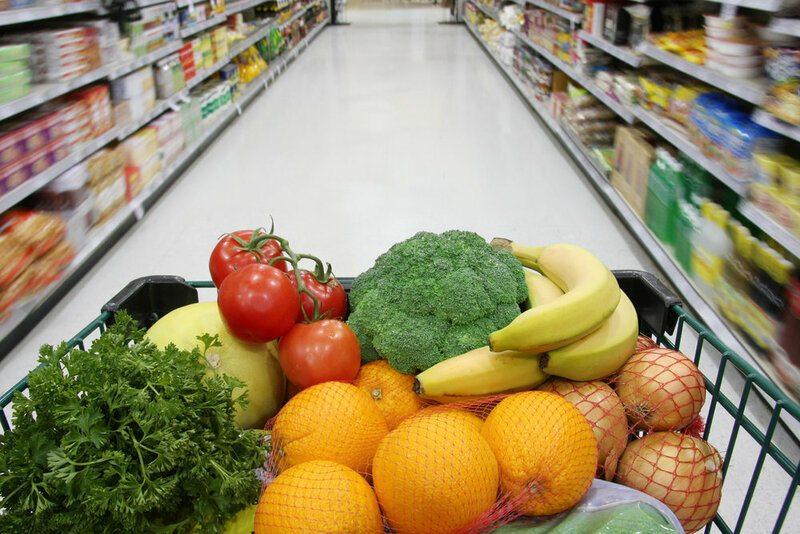 Be sure to subscribe to get more health hacks delivered right to your inbox. I got no kick against fall. It's the season of my birth; I like the pretty colors of the trees; you can pick apples and carve pumpkins; there's five or six Jewish holidays, and only one that forbids eating. Fall can be downright tolerable. So forgive me, on this cold wet day, if I don my rose-colored glasses and ogle some photos I took during summer, which I think of as fall's ditzy younger sister. More over, Moira, Tammy's in town. One of this summer's best events was a trip to Maine, where a large and excellent chunk of my family lives. We have a cottage that seems to be slowly sliding down the side of a hill, but if everybody sleeps on their right sides, we can delay its progression. Anyhoo, the deer flies also enjoy our cottage, and like to prey upon walkers in the crepuscule. But we showed them! At first glance this probably just looks like Anita's charming garden sun hat. But take a closer look. Gross, right? Normally I don't celebrate hunting and trapping of large game, but this is such a clever (elegant, almost?) way to take a fly-free walk that I just had to share it. Sticky fly strips sit on your hat, and when flies land, they don't take off again. Plus, the juxtaposition of the cheerful ribbon and the horror show of the glue tape speaks to the Deistic absurdities of natural rights and power. Or, maybe it's just gross. In case your eyeballs need a cleanser... walk with me, if you will, to the Coastal Maine Botanical Gardens! If you've never been, you must go. It's full of wonderful things that even people who think they don't like flowers (ahem, Dad...) can still enjoy. Tired of horizontal surfaces? Try this hip vertical bed, which is part of the accessibility garden. This comely frog is also part of the accessibility garden. What a juicy specimen! Moving still coastward, the trip included some great oceanic visions. I'm not likely to bask in the sun on a sandy white beach like a starfish; fortunately, my crusty ancestors forsook warm waves for the freezing crags that reminded them of home. Starkly beautiful, you might call it. A decidedly mai tai-free zone. This is a view off the shoreline of Monhegan Island, a wonderful spot inhabited mostly by artists and something like 60 year-rounders. The way to get there from the main(e)land is by ferry-- a trip I hadn't made in almost 30 years--and I thought it would be fun for Zoog* and me to putt across Muscongus Bay and spend the day on the island. It was a little choppy on the seas (3-to-5-foot swells, for those keeping score), and our captain informed us before we set sail that it was so rough anyone who wanted was free to get off the boat and receive a full refund. But we all stayed put, thinking that with enough ginger candy chews and blessings from our rugged ancestorys, breakfast would remain inside our bodies. And that was largely true. But not for the woman behind us. Good thing they'd handed out "discomfort bags" to all the passengers. Poor thing was sitting in the middle of three people, and yarked and yarked...audibly...heart-breakingly....horrifyingly...for 45 minutes, as those in front of her clung to the railings and talked with great focus about teapots and stamp collecting. But once we reached land and kissed the sweet ground we were ready for a little tromp. And tromp we did! It's possible to hike all the way around the island, but if you want to stop and stare at the water and eat leftover lasagna, you can only do about 3/4 of it. Which was more than ok with Zoog, since he could probably detect my plans for the next day, when we hauled up to a *fabulous* view at the top of Mount Megunticook, in Camden. Fun fact: You are not allowed to dock at this inlet unless your sweater is tied jauntily around your broad shoulders, and you can prove a proper "boat shoes" tan. This is probably a good reminder that the memories stored in one's brain are often better than the ones stored on one's camera. If color's gonna be washed out, let it be washed out with sunlight. What are we looking at? Where's the map? I thought you had the map. No? Ok, well, we'll just have to sit here and eat our trail mix, then. Warm rock brings out the lizard in all of us... brown lightly on both sides and serve with lemon butter sauce. Not Pikes Peak, but she's a noble hill. And some of the shorter-limbed hikers hitched a ride the whole way. CRat (pictured above) stowed away in the pocket of my cargo shorts, only to emerge when I dropped an M&M onto my lap. CRat displays the fullest extent of his magnanimity. Then self-administers a cootie shot. Even Pierre, who, it should be noted, has no limbs, somehow made it to the top. He posed for this sweet brotherly picture without losing his balance and plunging into the scrub pine. A successful trip, if ever there was! So now, as the days get shorter...and the temperature drops...and the lattes get all tarted up with ingredients meant to jolt us into caffeinated fits of consumerism (PUMPKIN spice? You wouldn't know a pumpkin if it grew up your pant leg! Humbug! ), I have these sunny memories to keep me chipper. Though I'm reminded of that saying so oft cross-stitched onto the scented pillows in every roadside knicknack store. Oh, Summer: I pine for you, and also balsam. I guess I'd better start looking on the bright side. The extra hour of sleep will be nice (that one night). I might sweat less in the course of a day. Mashed potatoes are back in season. That's probably the right attitude. And heck, in another couple months, the days will start getting longer again. Until then: Hello, Darkness, my old...friend? That bright orb is the moon. Kinda makes you wanna howl, no? d) Why must you quiz us so? These are the rhizomes. You commoners may think of them as roots. Thanks, HuffPo! We speak, of course, of the mighty sacred lotus, Nelumbo nucifera, the bean of India. Often appearing in Hindu and Buddhist iconography, the lotus springs up from the mud and symbolizes the potential beauty of all life, making it a perfect contender for residence in the NPS's Kenilworth Aquatic Garden , which sits in one of DC's poorest neighborhoods. The Aquatic Gardens, it seems to me, has the highest ratio of awesome-to-unknown of any national park in the district. Hie thee hence, gentle readers! I mean, how often do you see something like this west of Rangpur? "Not often!" says this handsome dragonfly. Some folks call these little spheres "seeds," but some call them "nutlets," which is the best term since "niblets," which itself, was only second to "bumfuzzle." Anyhoo, sometimes the nutlets are ground up and made into the filling for Chinese mooncakes. So add that to your rainy day must-do list. But that's not all: Kenilworth Aquatic Gardens also has an assortment of water lilies that would make Claude Monet poke himself with a paintbrush. Oil paints or finger paints? Though not teeming with locals, the Gardens were populated that day by a busload of Japanese tourists, most of them shaded from the hot sun by umbrellas, which came in handy when hot sun turned into hot rain and poured down upon us. ...this is him fifteen minutes later. But the noble bean of India didn't seem to mind. Kind of makes you want to ladle soup into these babies, eh? This extreme hydrophobia (stronger than Mr. Whiskers' aversion to the bath) apparently gave rise to the term "lotus effect," which means water beads up and makes the leaves self-cleaning. It seems that science has taken note of this fact, but I'm thinking of practical home decor applications like lotus leaf wallpaper (kitchen? dorm rooms? vomitorium? ), or DYI rain hat. Unlike the staffers and tourists in DC, who get stinky and funk-i-fied in mid- to late summer, the lotus blooms quite happily when the barometer rises. It can stand the heat; perhaps it belongs in the kitchen...? So next time you're twisted up in yoga class or cruising down the highway in a $70,000 sports car remember the humble origins of Nelumbo nucifera, say a prayer of purity and divine wisdom, and fire up that wok. Working at the Zoo has made a few things clear: March hares are mad; Goliath bird-eating tarantulas would rather snack on toads than Tweety, and naked mole rats (Heterocephalus glaber) are neither entirely naked nor much mole nor really rat. But they are...FABULOUS! Just look at those teeth! Those little paws! That tiny wrinkly body made translucent by the absence of adipose fat! These little subterranean treasures (they live underground in tunnels with 300 other family members) have dug their way right out of the dirt and right into my heart (seriously, don't ever let one of these things dig into your heart). I know they don't conform to traditional standards of beauty; but maybe their charm lies in the way their teeth grow outside their lips so they don't get dirt in their mouths when they dig with their incisors (the bottom two, by the way, can move independently of each other, like chopsticks). Hey: ALL God's critters got a place in the choir! Here, Philip practices the last few notes of Nessun Dorma. Pinkies-up is the proper petting etiquette, or "petiquette." Anyhoo, last month I was treated to an exclusive behind-the-scenes/beyond-the-tunnel tour of the Small Mammal House, and now, I, myself, am one very happy small mammal. Move over fawning fennec fox-- ta ta, tawdry tamandua-- step off, servile skunk-- anyone can love an animal with big eyes and a furry little head. Gimme a mostly-blind largely hairless tube of skin that will chew through the wires any day! 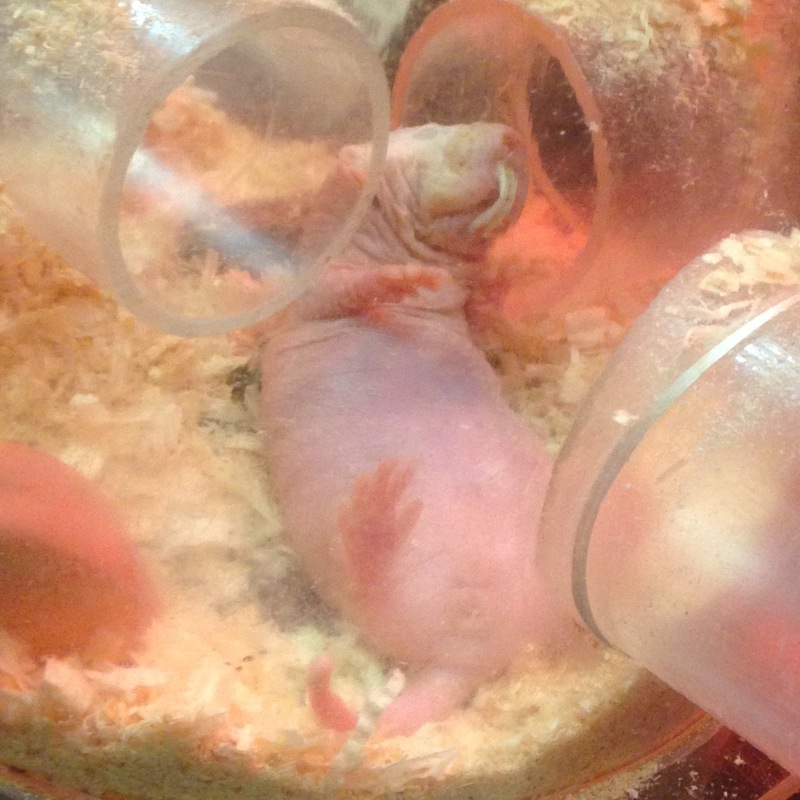 Naked mole rats are the only cold-blooded mammals. They are the longest-lived rodents on earth. In the wild they can live to about 30. If only the New York subway system were infested with these charmers instead of the hulking churls its got now. They can run as fast backward as forward. But they are also happy to climb over each other, especially if one stops to nap in a tunnel. Left tube? Right tube? Straight-ahead tube??? Charles is overwhelmed with possibilities. So now if we could just do a little creative rebranding on that name... (maybe we could upgrade the poor Screaming Hairy Armadillo while we're at it?) The Internet has suggested "Saber-toothed sausage," which I think has an agreeable cadence, but lacks elegance. Maybe we can call them cheetahs. Wait-- that's taken. Huh. What if, instead of improving "naked mole rat", we just call every other animal by a more realistic three-word descriptor? Snakes could be Scaly Legless Abominations. Cats could be Fuzzy Spasmodic Yarn-tossers. Sloths could be Smiling Moldy Tree-dwellers. And until such time as this noble creature has a noble name to match, consider me a member of the Screaming Hairy Hominids. All Hail the Blessed Day Star! Sunday was pretty extraordinary. The sun didn't just come up. Sun came out. Way, way out. And it shined the light of hope and justice and righteousness and everyone was feeling quite jolly. And just when it seemed the day couldn't get any brighter, out came the cheese board. Hard, Soft, Moldy, Stinky and Doc. I guess only two families can really say this, but for the next little while, I have the pleasure of living next door to Joan Nathan, famous food writer, cookbook author, historian, cook, woman about town, etc etc... Each year Joan hosts a totally fabulous fundraising event called Sips and Suppers, where Big Fancy chefs come to DC to cook dinner at various private homes and the money goes to charity. But this year, there was a little snag. See below. So the event itself was postponed, but a healthy handful of Big Fancy Food People staggered through the snow to Joan's house, and some of them were preparing a totally delicious brunch, to which we were invited, for the fee of helping out. Done! Jamon Serrano... complete with its own jamon Serrano holder. Smoked oysters... ok, so a lot of this stuff isn't kosher. But it's beautiful! Spicy delicious shakshuka with eggs. Try it now! Alice Waters. Alice bleepin' Waters! Ms. Slow Food herself! She brought no fewer than three dozen brown eggs, a bowlful of whole truffles, and the most beautiful piece of beef you've ever seen. This brunch, my friends, was no joke. It wasn't stuffy, either. Just a lot of high quality folks, and high quality chow, and a chance to hobnob, schmooze and chitchat with a decidedly different set. Ahem. And what of the day star, you ask? After I jammed all the food I possibly could into my face, I felt compelled to waddle out into the light and bask like a lizard in its glory. Make hay while it shines, DC! This shot was taken while sitting down in the snow like I was sitting in a beanbag chair, and bashing in a head hole to look properly up at the sky. And now, having illuminated the snow, and made it glint and gleam like diamonds, having elevated 30" x 200 miles of lowly frozen water, it's time for our blessed day star to melt it all into oblivion. I don't know if you heard, but DC got hit with something of a snowstorm. There was quite a lot of talk of this storm before it ever started snowing, so many of the District's residents decided to head immediately to their local grocers to procure provisions. Skeptics waited for some proof of Snowzilla before tearing up the road like their cold wet pants were on fire... oops. Is it possible there's a link between the absence of fibrous greens and the absence of toilet paper? I was a little bummed by the lack of salad, but Amanda Panda, Polies and CRat had a contingency plan. CRat's eagle eye spotted some discount havarti. Now, I'm not really one for winter, but there is something liberating about being able to walk down the middle of Connecticut Avenue and know you won't get hit by a car. Or, as it turns out, a plow. Then I hurried inside to fire up a big cauldron of whatever liquids were available. As I opened the door and struggled to pry my boots off, I heard distinct murmurings from inside the shopping bag. Something about wanting to build a snowman. I guess not everybody wanted so desperately to escape Khione's wrath. There comes a time in every gardener's life--often, say, early August-- when usually-petite, soft-spoken, and sometimes foreign vegetables become hulking, tough, intractable bludgeons. This is such a time. Our absent hosts, whose home we are enjoying perhaps too thoroughly, have an excellent little veggie garden bursting with produce. "Eat some zucchini!" they ordered us on the way out the door. And wanting to be invited back next year, we did. We've sliced it into tacos, we've chopped it into frittatas, we've grated it into muffins, we've blended it into breads, we've sent some home with visitors and we've (I've) used it as a prop in an off-off-off-Broadway production of Our Town. Dave and F.CRat watch bemusedly as the zucchini fumbles its lines. The 'Stock, as all the hepcats call it, is nestled near to some very excellent hiking, so Sophster and I have been doing a fair amount of trekking into the mountains. Here's some, now! This is a shot from the top of Overlook Mountain (R). Pierre likes snacks you can nap on. Look how he can't believe this fortuitous combo. He and I have been working on cultural sensitivity this summer (time was when would talk of nothing but French fries, French doors, French horns, and, I'm reluctant to admit: French kisses), so I was quite pleased when Pierre offered up a more charitable summit summation as he and Sophie and I gazed down at Mr. Hudson's valley from the top of a Catskill mountain. He tipped his head toward the east and chirped: "The Dutch do nice work!" Life's been difficult lately. Sophie and I are cat-sitting in Woodstock for the week, and between the tuna and the drum circles and the lounging by the pool, I'm plumb tuckered out. Yes, my legs have that hip "ombre" color shading everyone's so big on these days. Our charge, Hibou, is pretty good, as cats go. Which is to say that he hasn't yet sucked our marrow as we slept. He keeps pretty busy; half the day is spent splayed out in sunbeams, a quarter is taken up with moth/spider torture, and the rest is divided about evenly between glaring at his dry kibble and glaring at us. Hibou wonders why you are not tending to his needs. Other than keeping the cat alive, we have relatively few responsibilities, but the ones we do have we take very seriously. Take, for example, the task of emptying the skimmer basket by the pool and saying Kaddish over whatever poor creatures have met their watery end. Usually it's beetles or grasshoppers, some of whom I try to resuscitate with chest compressions, which seems to have a relatively low success rate. But on Tuesday, a critter most precious must have flopped into the pool and gotten sucked into the filter, because when Sophie opened the lid, she yelled to me to bring the tiny defibrillation paddles. I was basically paralyzed with fear, so my clear-headed pal pulled a pail off the fence and bravely scooped the wee beast on to the grass. "HHHHHH POOR DEAD THING!!" I wailed. "NOW NESTLED IN THE ARMS OF YOUR MAKER!!" The force from the filter sometimes creates a little eddy in the skimmer basket, and I'd like to think Francis Frog was merely very dizzy from spinning around in the whirlpool, and just about to skip home to his family--not simply destined to be hawk food. But I guess if I were a real Woodstockian I'd mumble something about 'circle of life,' and grok some tempeh. Maybe one day I'll get the hang of it. But now if you'll excuse me, I must oversee the fermentation of my kombucha before Sophie drives a broken down bus to past life therapy. Valentine's Day is here, and it can be a little tricky navigating your way to the perfect gift. Cards are great gift for a spouse, and flowers are great for mom, but what do you get the woman who is both your wife and your mother? Introducing: Oedipal Arrangements (R) ! Order now! For 2 easy payments of $29.95 or the cost of accidentally killing your first born, this terrific gift can be yours...If you can't see this is a great deal, you must be blind! !